As a work at home mom, you've probably read about dozens of different business opportunities. Maybe you've even tried some of them on for size, hoping to find the one that lets you make a good income while still staying home to care for your kids. Some work at home businesses are notoriously shady. Just mail in a check to some random stranger and then hope that he hands you the keys to a successful business. Others are great opportunities….if you have $20,000 to invest in startup costs. And some just might not suit your personality. Like if it were my job to Facebook message my entire friends list about an MLM product……..well, that's just not gonna happen. So I wanted to let you know why I'm absolutely crazy about Amazon FBA as a business for stay at home moms like me. I narrowed down the top 10 reasons why I love selling on Amazon as a mom and I'm sharing that with you today. As you read it, imagine what this might look like for you and your family. 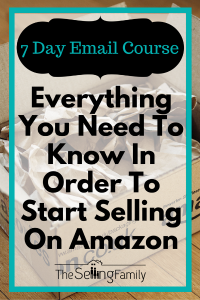 If Amazon selling sounds like something you'd love to do, it's super easy to get started. I want to start with the absolute most important reason I love selling on Amazon: I get to stay home with our son. When Cliff and I got married, we decided that when we chose to have kids we wanted to be in a place where I could stay home. Of course, we didn't know back then that it would be because I was running a six-figure business! I have been home with Aiden ever since the day we brought him home from the hospital. We decided to retire Cliff from his 9-to-5 management job when Aiden was still a baby. This means our son has never known what it's like to have parents who work outside the home - and we'd like to keep it that way! Cliff and I work really well together so it's nice to spend more time with him as well. When he still worked his corporate job, I only saw him after he'd get home from his stressful day at work (and nights were my time to work on eBay and Amazon back then). Now we are both home to spend time with our son while growing our business together. My mom even helps us with the business by getting shipments packed up and picking up inventory for us. An Amazon business is a great way to get the whole family involved, no matter what your family looks like. If you're a single mom, your kid can help you shop for inventory or prep items for shipment. If you're married, it's easy to divide the tasks up between two people. We love setting a good example for our son by working as a family and involving him. Depending on the age of your kids, they can help with things like removing price tags, placing items in bags, or packing up boxes. Not only do I get to work at home with my family by my side, but I get to choose my own hours. As our business has changed over the last 10 years, I've had a lot of flexibility with scheduling. Even when Amazon was the only income source for our family of three, I was only working about 20 hours per week. It also means we have the option to take time off without losing money. And we have the freedom to do fun family stuff like hit a carnival on a Tuesday instead of a busy Saturday. We could take a whole week off from sourcing new inventory and still see income flowing in. That's because we use Amazon's Fulfilled by Amazon (FBA) program. As long as we have inventory at the Amazon warehouses, then we are still making sales and getting paid by Amazon. When I first started selling on eBay in 2005, it was just a hobby. But once I was laid off from my job, I decided to really focus on eBay selling to replace my income. It didn't take long for me to make that happen with eBay. Because I wanted to make more money (enough to bring Cliff home), I had to look beyond eBay. With eBay, I was running out of hours in the day to buy inventory and create my own listings and ship packages to customers. When I heard about Amazon FBA, I knew that it would allow me to grow much faster. Amazon FBA is the kind of business model where the more you put into it, the more you get out of it. Because so many parts of Amazon FBA are passive for us (because we don't have to ship products to customers or deal with customer service), we can choose to keep scaling our business. But we never set out to be a million dollar Amazon company. We've been so happy to earn six figures on a part-time schedule. The first year that Cliff joined me (In 2011), we had over $300,000 in sales on Amazon. Plus, we know from our own students that many sellers go on to earn more than 6 figures through Amazon FBA. You can really make your Amazon income work for you. If you just need an extra $500 each month to help pay bills or save for retirement, then you can do Amazon FBA in a really part-time capacity. But if you want to run your own Amazon empire (and maybe even get the whole family involved! ), then that can be done too. Do you already love to shop or have a knack for spying the best deals? If you do, then an Amazon FBA business can be fun AND profitable! In fact, when we are checking out at the register, we like to play a game where we add up the profits instead of the amount of money we spent. It's a lot more exciting that way to know that we just left a store with extra money in our pockets. Of course there is a downside that I need to warn you about. You will never again take “just a quick trip” to the store. I can't even pick up a prescription from Walgreens without taking a lap through the clearance and toys aisles! As our Amazon business grew, I would sometimes stop to think about how things would be different if I weren't using the FBA program. And the reality is….I would look like a total hoarder! There are still times when we have bought a huge amount of inventory and it has taken us a couple of days to get it shipped to Amazon. And we've spent those days stepping over piles of tea boxes or eating on the couch because the dining room table was covered with stuffed animals. But it's still just a temporary thing. If we weren't using Amazon FBA, our home would be beyond cluttered. And to be honest, we would probably need to rent a small warehouse to store and fulfill our own inventory. Luckily, we get inventory into our home and then try to ship it back to Amazon as quickly as possible. This lets us grow our business without literally tripping over our own inventory. I just love being my own boss. I think I'm the best boss I've ever had 🙂 And now that I've been selling on Amazon for so many years, I feel like I'm truly unemployable. I can't imagine ever going back to the 9-to-5 employee lifestyle. Being my own boss means that I have no deadlines, timeframes, or quotas set by someone else. Of course, I have my own goals for the success of the business, but those are all my decision (and I do check in with Cliff!) This gives us so much freedom to work in a way that's best for us. Let's say that one of us gets sick. It's no problem for us to just take a few days off to rest and recover. We don't have to worry about “calling it in” or using up precious PTO days (which I didn't always have anyway!). And we don't have to feel guilty about coworkers who have to cover for us while we're gone. Here's the ultimate proof that I'm my own boss: I make a full-time income while still getting to stay home and homeschool my son. Can you imagine telling your boss now, “I can't come in until 2:00 because I'm doing homeschool right now”? I don't think you'd be employed much longer! It has always been our plan to homeschool our son and we were able to do that starting with kindergarten. Because we have so much flexibility with our schedule, we're able to work with him every morning and then switch over to Amazon or blogging work in the afternoons. And it's not like his education ends at lunchtime! He then joins us as we work on our business. He is learning a lot about money and work by having two entrepreneur parents. He even invests in his own products to send to Amazon and we help him track his sales! Another thing we love to do as a family is going on weekday sourcing vacations. This means that we can travel as a family, even going somewhere fun like Disneyland, but do some sourcing while we're on the road. We can always map out a road trip that allows us to hit lots of locations of our favorite stores. When do take sourcing vacations, we often make more money on our sourcing finds than we spent on the vacation expenses like hotel stays or eating out. Even if it doesn't cover the whole cost, it can really offset a lot of the cost of traveling. Of course, sometimes we do take a “real” vacation where we try to unplug our laptops and stay away from the Amazon Seller App on our phones (easier said than done!). Strategic sourcing trips can also lead to more deductions at tax time. If you start doing this, check in with your CPA to see which travel expenses could be tax-deductible on your tax return. Every little bit helps with lowering that tax bill! When we started with eBay and then Amazon, we did not have a lot of extra money lying around. I had just lost my job and we were hoping to start a family soon. That's why I am so thankful that you can start an Amazon FBA business as a work at home mom for a very reasonable cost. If we had wanted to start a brick & mortar store or do some kind of franchise, we would have needed thousands of dollars just to get started. We probably would have had to get a loan from a bank just to handle the startup costs. But luckily I was able to start selling on my own with just the money from my last paycheck. And because I reinvested some of that profit back into the business (and switched over to Amazon FBA), I was able to grow to a full-time income quickly. Amazon is perfect for moms who don't have tens of thousands of dollars sitting around to invest in a business opportunity. You can actually get started for about $1,000 just like I did. One of my favorite things about being an Amazon seller is that it led me to blogging. In 2012 I started blogging as a way to connect with other sellers and share some information about the way I ran my business. By 2014 we rebranded as “The Selling Family” because it represented everything we loved about Amazon. Now I get to help so many people start and grow their own Amazon businesses. Between my blog, training programs, and Facebook groups, I am so blessed to have met so many incredible and inspiring people. And I'm even happier when I learn that other work at home moms have used Amazon as a way to support their families. 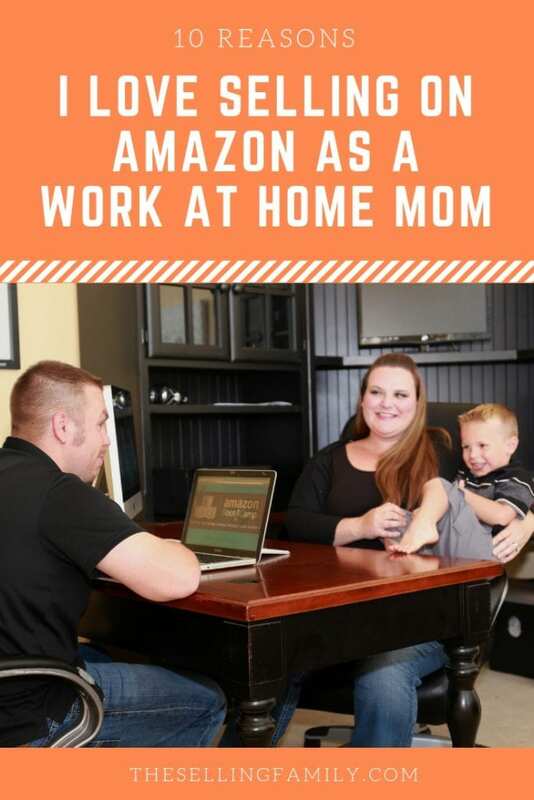 I love Amazon not only because it changed my life as a work at home mom, but because I know it's a great business for other moms, too. As a mom, your Amazon business can be whatever you need it to be. Full-time or part-time. Six figures or fun money. With a partner or as a single mom. If you put the work into your Amazon business (and remember that it is a business), you'll be rewarded with the flexibility and freedom to work from home while still supporting your family. That's pretty awesome if you ask me! So, moms - I want to hear from you. Are you on the fence about starting an Amazon business? What's holding you back? Let me know in the comments below. I belong to the FBA program, I’ve many health problems. My fear is loss of benefits going on the books? I’m sure you’ll say u can make it doing FBA not that easy, some days are uncontrollable, and limited income on SSD. Stuck between rock & hard place? The fear of failing is one of the reasons I hear the most for people not getting started, so you are not alone. I bought your course about 8 months ago. It is amazing! I love all the detail you put into it. My business has grown faster than I expected thanks to the info I learned from Amazon boot camp. Here is a link to the course. Amazon Boot Camp.